The Pittsburgh synagogue-shooting suspect committed the massacre with three handguns and an AR-15 assault rifle he purchased legally after passing all background checks, law enforcement sources told ABC News. 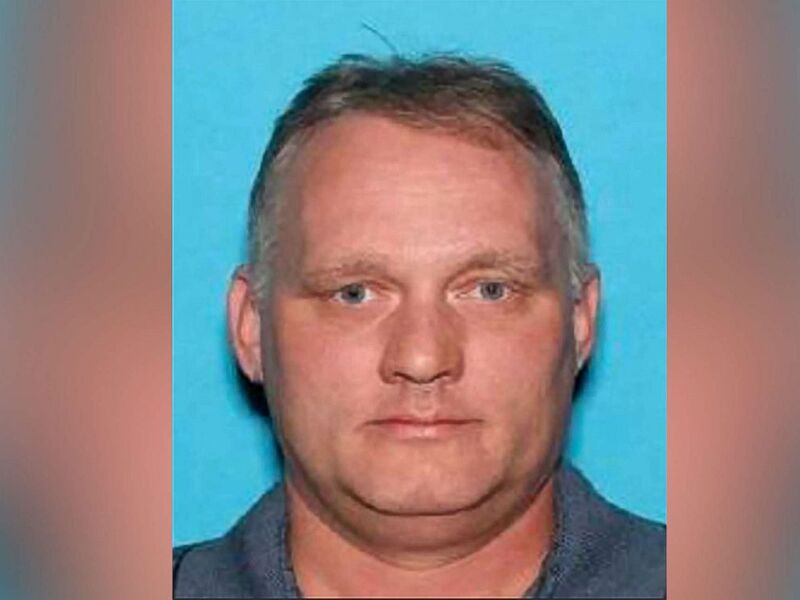 In addition to the four guns Robert Bowers used in the bloodbath at the Tree of Life synagogue, federal agents seized six other guns at his home in Pittsburgh, sources said. All of those weapons were also purchased legally after Bowers cleared federal background checks, the sources said. News of his arsenal came as the 46-year-old suspect was pushed in a wheelchair into a federal courtroom in Pittsburgh for his first hearing, and as the White House announced President Donald Trump is planning to visit the city Tuesday to express condolences to the families of the 11 killed in the Saturday's rampage. "Tomorrow the president and first lady will travel to Pennsylvania to express their support of the American people and grieve with the Pittsburgh community," White House press secretary Sarah Sanders said. A woman reacts at a makeshift memorial outside the Tree of Life synagogue following Saturday's shooting at the synagogue in Pittsburgh, Oct. 29, 2018. Bowers appeared before U.S. Magistrate Judge Robert C. Mitchell just hours after being released from a hospital, where he had been treated for bullet wounds suffered in a gunfight with police at the synagogue. It was his first hearing on a litany of charges that could result in the death penalty if he is convicted. The crowd in the courtroom fell silent as Bowers was wheeled before the judge. He jerked his head left and right as if taken off guard when Mitchell ordered "all rise," prompting everyone beside and behind Bowers to stand. Wearing a blue sweatshirt and a blank expression, he listened as Mitchell explained the charges against him. Bowers answered, "yes, sir," at various points when asked if he understood what was being said. "You have a right to be released on bail," Mitchell told Bowers, whose attorneys, appointed to represent him specifically for the hearing, waived his right to challenge a request from U.S. attorneys to detain him without bail on grounds he is a flight risk. A fan holds up a sign to honor the victims of the shooting at the Tree of Life Synagogue during the game between the Pittsburgh Steelers and the Cleveland Browns at Heinz Field, Oct. 28, 2018 in Pittsburgh. Bowers requested a public defender be appointed to handle his case. The judge scheduled a preliminary hearing for 10 a.m. on Thursday, which is when federal prosecutors will present evidence, Scott Brady, U.S. Attorney for the Western District of Pennsylvania, told reporters after Monday's hearing. "We will have the opportunity to present evidence demonstrating that Robert Bowers murdered 11 people who were exercising their religious beliefs and that he shot or injured six others, including four of whom were police officers responding to the shooting," Scott said. Brady said that the law requires prosecutors to present a case against Bowers to a federal grand jury within 30 days. Bowers is charged with 29 federal counts, including hate crimes. His charges include 11 counts of obstruction of exercise of religious beliefs resulting in death, 11 counts of use of a firearm to commit murder, four counts of obstruction of exercise of religious belief resulting in bodily injury to a public safety officer and three counts of use and discharge of a firearm during and in relation to a crime of violence. The four counts of bodily injury to a public safety officer stem from the four police officers injured in the shooting. If convicted, Bowers could face the death penalty. Bowers was shot multiple times in a gunfight with police that capped Saturday's massacre at the Tree of Life synagogue. He was discharged from Allegheny General Hospital in Pittsburgh at 9:45 a.m. on Monday, a hospital spokeswoman told ABC News. 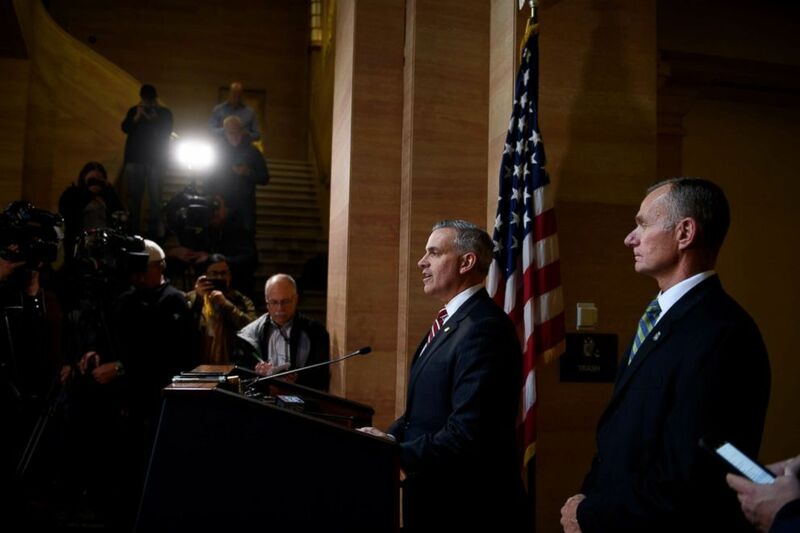 U.S. Attorney Scott Brady and FBI Agent Bob Jones announce the arraignment of Robert Bowers, the defendant in the mass shooting at the Tree of Life Synagogue, on Oct. 29, 2018 in Pittsburgh. 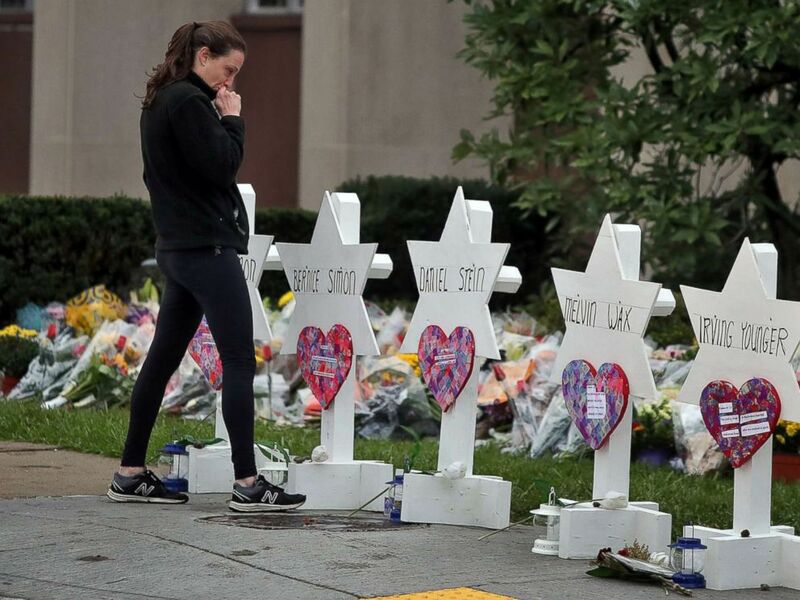 As Bowers appeared in court, a member of the Pittsburgh emergency medical services tactical team that went into the synagogue described to ABC News the carnage and two bullets he witnessed while the shootout with the suspect was going on. Dr. Keith Murray, a trauma physician trained to carry and use an assault weapon, said his team climbed to the second floor of the temple Saturday morning to rescue two badly wounded SWAT officers even as a gunfight was commencing with the suspect cornered on the floor above them. Murray said the SWAT officers were riddled with bullets, but within thirty seconds both had been carried down to the mini staging area Murray and his team began to treat them immediately. Murray said one wounded officer had bullet wounds to both legs, an arm, and his head, but he was still conscious. The officer was still losing blood fast and went into hemorrhagic shock on his way to the hospital. "So if we weren't there, there's no doubt in my mind he'd be dead," Murray said. Blood was dripping from the wounded officer as Murray and his team carried him out of harm's way. Murray said they cinched tourniquets on the officer's extremities and called for a medevac as dozens of rounds were being fired on the floor above them. This image shows a portion of an archived webpage from the social media website Gab, with a Saturday, Oct. 27, 2018 posting by Pittsburgh synagogue shooting suspect Robert Bowers. HIAS is a nonprofit group that helps refugees. He said that while searching for other victims, they came upon an elderly temple member who had been shot in the arm. She was slumped over a body of a fellow congregant. At first, Murray and his team thought she was dead. But as they approached her, guns at the ready for the suspect who had yet been apprehended, the injured women began to sob, Murray said. The rescuers ferried her to safety, he said. 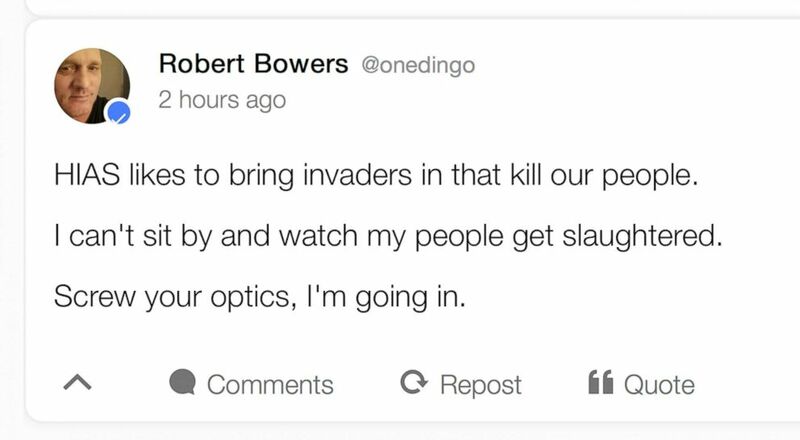 In a social media message that Bowers allegedly posted shortly before he stormed the synagogue on Saturday morning, he referred to the Hebrew Immigrant Aid Society (HIAS), a more than 100-year-old nonprofit that aids refugees. He wrote that HIAS brings in "invaders that kill our people," concluding, "Screw your optics, I'm going in." Bowers was allegedly wielding three Glock 357 handguns and an AR-15 assault rifle when he stormed the temple Saturday morning and shot congregants at random, law enforcement officials said at a news conference on Sunday. "All the weapons he brought into the facility were used," said Bob Jones, special agent in charge of the FBI Pittsburgh office. The 20-minute rampage ended in a gun battle with SWAT team members on the third floor of the synagogue. Even as he was being treated for his wounds, Bowers allegedly screamed at a SWAT officer that he wanted "all Jews to die," according to a criminal complaint filed against him. Killed in the attack were Joyce Fienberg, 75, Richard Gottfried, 65, Rose Mallinger, 97, Jerry Rabinowitz, 66, Daniel Stein, 71, Melvin Wax, 88, and Irving Younger, 69. Also killed were brothers Cecil Rosenthal, 59, and David Rosenthal, 54; and Bernice Simon, 84, and her husband, Sylvan Simon, 86. Six people were injured in the rampage, including the four police officers. Three of the officers remain hospitalized, one in critical condition. Of the three civilians still in the hospital, one was in critical condition and two were in stable condition, officials said. The U.S. and the Israeli flags are projected on the walls of Jerusalem old city, Oct. 28, 2018, to show solidarity with the Pittsburgh Jewish community following the shooting attack at the Tree of Life synagogue in Pittsburgh. The shooting rattled nerves across the country and globe and prompted an outpouring of support and condolences. In New York, the Empire State Building went dark except for an orange halo on the mast to honor the victims. In Paris, the Eiffel Tower also went dark in homage to the victims. 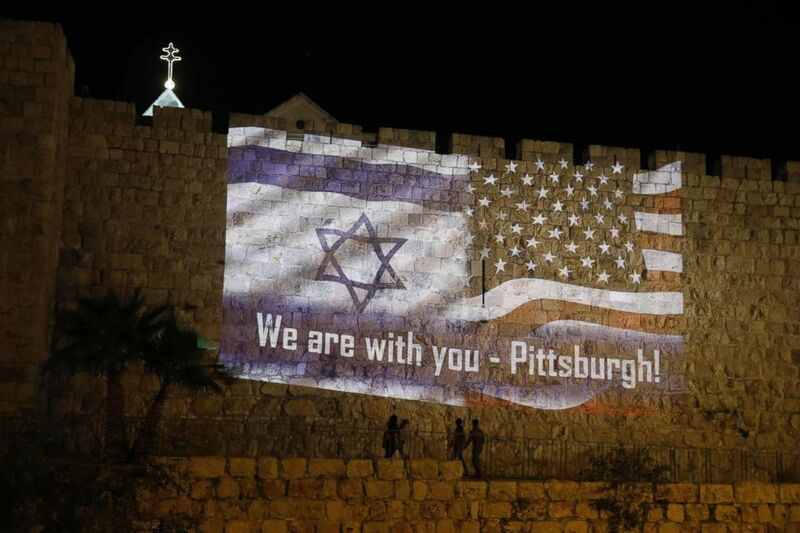 The U.S. and the Israeli flags were also projected on walls of the of Jerusalem's old city to show solidarity with the Pittsburgh Jewish community. The Pittsburgh Steelers also held a moment of silence before Sunday football game at Heinz Field in Pittsburgh to honor the victims. Pittsburgh Mayor Bill Peduto said the city of Pittsburgh will stand by the victims' families and help them get through the tragedy. 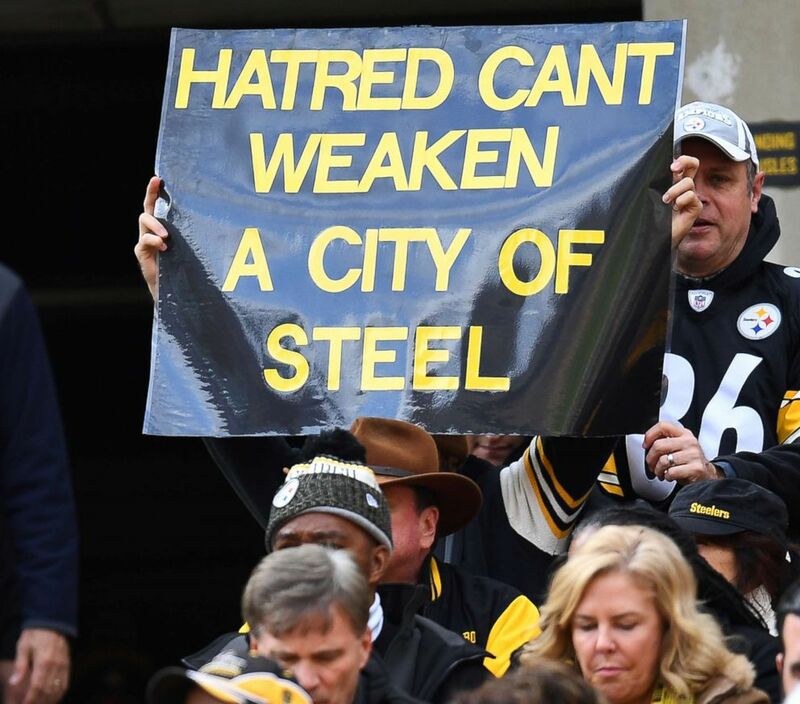 "Pittsburgh is a strong town. We are a resilient city," Peduto said at Sunday's news conference. "We'll get through this darkest day in Pittsburgh's history by working together."